Two identical experiments were conducted in the greenhouse at WSU TFREC to test the ovicidal activity of various insecticides. The first involved nine insect growth regulator insecticides (IGRs), the second tested Bexar and Assail; both experiments included water as a control. 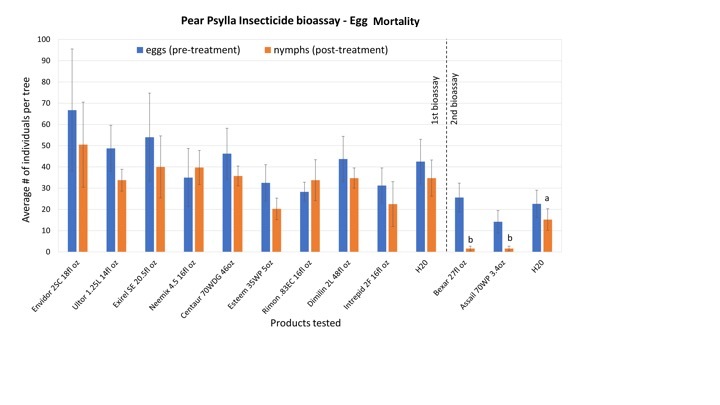 The objective of the first experiment was to determine if and which IGRs commonly used in pears would prevent nymph development when applied to psylla eggs. Eggs were sprayed, then given time to hatch. Once sufficient numbers of honeydew producing nymphs were observed on control trees (9 days after application), all other treatments were sampled. All treatments began with similar numbers of eggs; therefor, differences in the numbers of nymphs should represent varying levels of toxicity among treatments. At nine days after treatment, no differences were observed in the numbers of nymphs that developed among treatments or the control in the first experiment. Key Finding: None of the IGRs tested reduced nymph development when applied to eggs. A second experiment was conducted to test the validity of this method, since no treatment effects were observed in Experiment 1. Two insecticides with recent evidence of ovicidal activity (Bexar and Assail 70WP) were tested in the same manner as Experiment 1. All treatments began with similar numbers of eggs; therefore, differences in the numbers of nymphs should represent varying levels of toxicity among treatments. At nine days after treatment, both Assail 70WP and Bexar had significantly fewer healthy nymphs than the water control. The method was effective for detecting egg toxicity. Assail 70WP and Bexar both inhibited the development of eggs into nymphs compared to the control.